Damage of tissues of an organism undergoing subsequently several stages of healing, which leads either completely healed without evidence of prior damage (for example, when you cut knife for cutting onions or when a small child breaks the elbow, the skin is several weeks completely healed), or scar formation ( For example, after surgery). So it depends on the depth of damage (in case of injury, which not only affects the skin, but is deeper, it may leave a scar). Immediately after injury occurs to form a blood clot (thrombus) at the site of damage, which is then dissolves during 7 days. In individuals suffering from blood coagulation disorders (such as those with hemophilia, von Willebrand disease, etc. ), Or dissolution of the precipitate heal traumatic injury slower and more difficult. The next stage is the accumulation of inflammatory cells in the lesion. The lack of these functional cells (in leukemias, lymphomas, congenital deficiency of certain white blood cells in HIV infections …) or oversupply (current severe bacterial infection, the wound can get such as after surgery or during bad debridement after injury) means that the healing process will be slower and may complicate any further infections. When the formation of new tissue is needed vitamin C to a well-formed collagen tissue.Insufficiency therefore also leads to disturbances of wound healing, which after some time and can spontaneously open again. During recovery, eat a lot of vegetables and fruits! 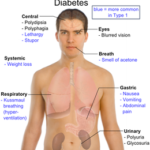 Healing can be impaired in diabetics and elderly people who already have impaired blood supply of tissues. This also contributes to slower healing of wounds.